Getting a German Shepherd puppy certainly brings a lot of fun and excitement into your life, but it also brings new responsibilities and challenges. One of them is housetraining. 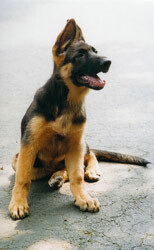 You should start to housetrain your German Shepherd puppy as soon as you bring her home. Consistency, repetition, and good timing are the keywords in housetraining. Your puppy needs to relieve herself quite often until about 4 months old, so this important period requires a lot of commitment on your part. Ideally, you should take your puppy outside every two hours during the day, especially after every meal, after a round of play, right after waking up, and at least once during the night. Luckily, this will not last long, and with some patience you will soon enjoy a full night’s sleep. Dogs prefer routine, so the more routine you make your training, the faster the results you will get. To make housetraining routine, use these two tips: first of all, always take your puppy to the same area for potty. This has several advantages: your puppy will be more likely to learn to go in one area of the yard (for example, a wooded part) to do her business, and you will not have to clean up after her all over the yard. Also, by doing so, your puppy will be “reminded” by the smell of previous visits what she is out for, and she will go potty faster. If you take her to different places every time, she will first take time to investigate the area - not the most attractive situation during the rain or when in a hurry. Secondly, use the same words every time your puppy is about to go potty, for example “Go potty,” or “Get busy,” or any words you like, as long as you use the SAME words every time. Also, use the same phrase to let her know that she did good after she is done. For example, say “Good girl! Good girl!” in a happy voice. If you have to leave your German Shepherd puppy alone for a long period of time (when you go to work, for example), leave her in a place that you don’t mind cleaning up, such as an area of the house with a hard surface floor. Never scold your puppy if you discover a mess upon returning home. Puppy will not understand what she did wrong - too much time has passed. This is a rule for any “mischief” that your puppy does - there should be NO delayed punishments. This scenario teaches your German Shepherd puppy only two things: you become bad-tempered without a reason, and the best way to deal with this is to become submissive. This is exactly what you want to avoid teaching your German Shepherd puppy, so put your frustration aside, clean up, and try to check on your puppy at least every 4 hours to give her a chance to potty outside. When playing inside with your puppy, keep an eye on her AT ALL TIMES. If you notice that your puppy circles and sniffs around looking for a spot to potty, or if you catch her in the act of doing so, say “No” emphatically, get her and take her out to the regular “potty place” immediately. Don’t forget to praise her lavishly when she does it outside. If an inside accident happens, it is important to clean up the area very well, using a strong cleaner, such as diluted bleach, so that there is no smell left that could attract your puppy to use the same spot in the future. German Shepherd puppies naturally want to keep the place they live in clean. This instinct will help you greatly in housetraining, and hopefully by the age of 6 months the accidents inside will no longer happen - if you let your puppy out at least 4 times a day.